Here is a Strong Promise ... Read This or Go Broke! Order now! Can you spare just a few minutes a year to beat the market? 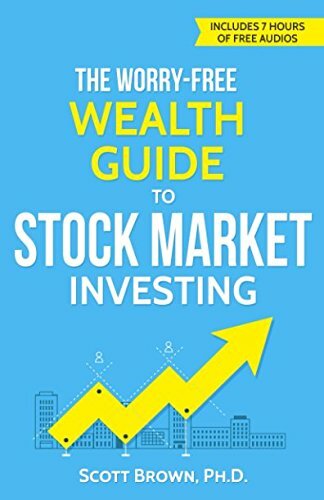 The Worry-Free Wealth Guide to Stock Market Investing and its FREE BONUS AUDIOS AND VIDEOS is a plain language, clear, concise, and powerful “magic formula” approach to a Stocks for the Long Run investment strategy that Warren Buffet himself describes as the best for most stock market investors. In this 2017 edition, readers will learn one simple -- 10 minute a year -- strategy to beat the S&P 500 returns and the best ETF and mutual fund index products for this approach -- the foundations for single momentum stock option strategies known to quadruple average stock market returns -- insights investors can use to avoid disasters such as Bernie Madoff, The Wolf of Wall Street, and the Black Swan stock market crash of 2007-2008 -- clear and easy to understand explanations of all complex principles hidden in the background of Wall Street, thoroughly updated reference lists, including new websites, new software, new brokers, and new publications. If you're building the foundation of your million-dollar stock market portfolio, The Worry-Free Wealth Guide to Stock Market Investing is a resource that no serious investor can be without. The Worry-Free Wealth Guide to Stock Market Investing is from bestselling nationwide expert investment speaker and major state university business school finance professor Dr. Scott Brown. This book is recommended preparatory reading for anybody enrolled or enrolling in his MBA investment courses. The free online course offer is worth $200. That is just the start of free and discounted investment wisdom. This book is your to door to explore. Here is what the best of the best have to say about Scott, “What is unique about Dr. Brown is that he is one of the very few doctors of finance that can see the forest through the trees…” Dr. Van K. Tharp, Ph.D. Cary, NC worldwide leading investment psychologist featured in Market Wizards: Interviews With Top Traders by Jack D. Schwager Order now! If you have any questions about this product by Worry-Free Wealth Publications, contact us by completing and submitting the form below. If you are looking for a specif part number, please include it with your message.